A few couple of warm days, the appearance of a few tulips, and wham, homebuyer sentiment goes through the roof. At least the results from the March National Housing Survey (NHS) seem to support that theory. 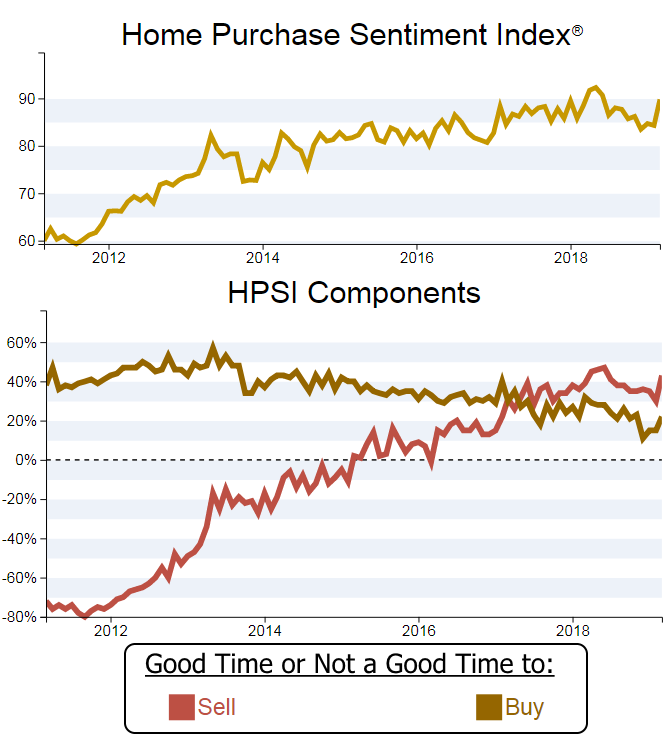 Net positive responses to whether it is currently a good time to buy and/or sell a home shot up 7 and 13 percentage points respectively in March, driving Fannie Mae's Home Purchase Sentiment Index (HPSI) up by 5.5 points. The Index rose to 89.8 percent, 1.5 points higher than in March 2018 after a winter of relative consumer pessimism. The index plunged 12 points to an all-time survey low of 83.5 in December and had risen only slightly since then. The March recovery was also aided by survey responses reflecting slowing appreciation in home prices and newly low interest rates. The HPSI distills information about consumers' home purchase sentiment from six questions on the NHS into a single number. The HPSI reflects consumers' current views and forward-looking expectations of housing market conditions and complements existing data sources to inform housing-related analysis and decision making. "A brighter housing market outlook drove this month's increase in the HPSI - a welcome sign from consumers as we enter the spring and summer homebuying seasons," said Doug Duncan, senior vice president and chief economist at Fannie Mae. "The results further corroborate the positive effect of falling mortgage rates on affordability, which we expect will help support a rebound in home sales." "Continuing a five-month trend, the net share of consumers who believe mortgage rates will go down increased 7 percentage points amid a 35 basis-point drop in mortgage rates in March alone," continued Duncan. "Meanwhile, job confidence - little changed from last month's survey high - also continues to support housing sentiment, while income growth perceptions firmed from both prior month and year-ago levels, potentially supporting an uptick in housing demand. Additionally, consumers appear to have regained some confidence in the housing market, with perceptions of both home buying and home selling conditions returning to their longer-term trends." Sentiment was even higher regarding selling a home. The net share saying it was a good time to sell rose from 30 percent in February to 43 percent. That puts this component up 4 point from the same time last year. The net share of those expecting continued increases in home prices rose 5 points to 38 percent, 4 points lower than in March 2018. While more than half of respondents expect mortgage rates to go up compared to only 6 percent looking for further declines, the net increased 7 points to -45 percent. The NHS, from which the HPSI is constructed, is conducted monthly by telephone among 1,000 consumers, both homeowners and renters. In addition to the six questions that form the framework of the index, respondents are asked questions about the economy, personal finances, attitudes about getting a mortgage, and questions to track attitudinal shifts. The March 2019 National Housing Survey was conducted between March 2, 2019 and March 24, 2019. Most of the data collection occurred during the first two weeks of this period.